The ukulele is easily the most portable music instrument available, combining easy-to-learn, pleasing to the ear, and hip factors into one small package. Ground yourself in the art of music expression and discover new dimensions of connecting with God and man. Engage in the wisdom of musical creativity in our Worship Dynamics modules. Experience the beauty of ensemble playing that harmonically unites the hearts of those making it. The Believer Ukulele Program™ is designed to enhance the dynamics of group-level worship by tastefully complimenting the functions of other instruments. 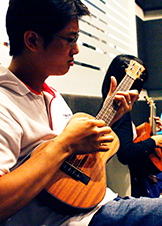 If you dreamt of playing the ukulele with skill and panache...We will take you there.